The COPPER-T-2/4 can extend a T1 Demark over 2 wires or 4 wires via G.SHDSL bis. The T1+E1 uses balanced 120ohm and 100ohm via T1 RJ45. The E1 unbalanced 75ohm uses dual BNC’s. The serial port V.35 interface uses a DB25 connector with a DB25 and V.35 adapter cable. DB25 is RS530, X.21 and RS449. The serial data rate is up to 5.7 mbps over 2 wires and up to 11.4mbps over 4 wires. Ethernet 10/100 auto negotiated via the RJ45 LAN connector. The range of interfaces enables fast and cost-effective services on voice, TDM and Data on a single or two wire pair of existing copper loop infrastructure. 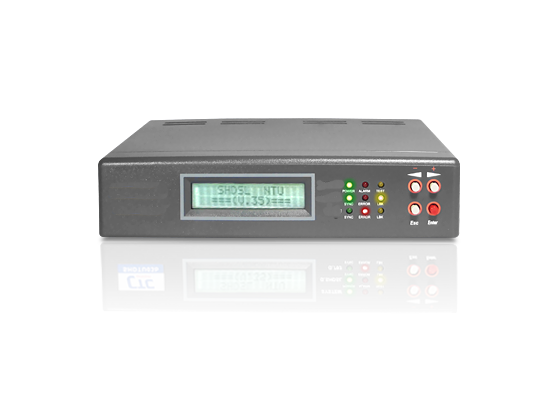 The COPPER-T-2/4 can be configured and managed with the LCD on the front of the unit or menu driven by a VT100 asynchronous terminal interface locally or remotely.